Sometimes you just need to get out and ride. I don't mean just around the block or fighting rush hour traffic, but hours in the saddle laying down some serious miles. 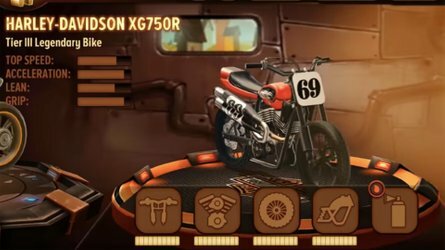 Think Captain America in Easy Rider; just you, your motorcycle and the road stretching out in front of you. 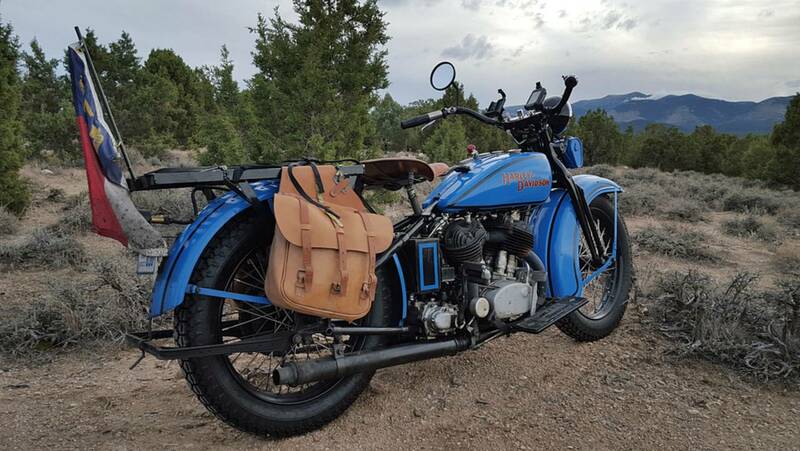 The western part of the continental United States offers a multitude of possibilities for this type of riding, but it's good to balance desolation with at least a few towns, so you can get gas and a bite to eat every so often. 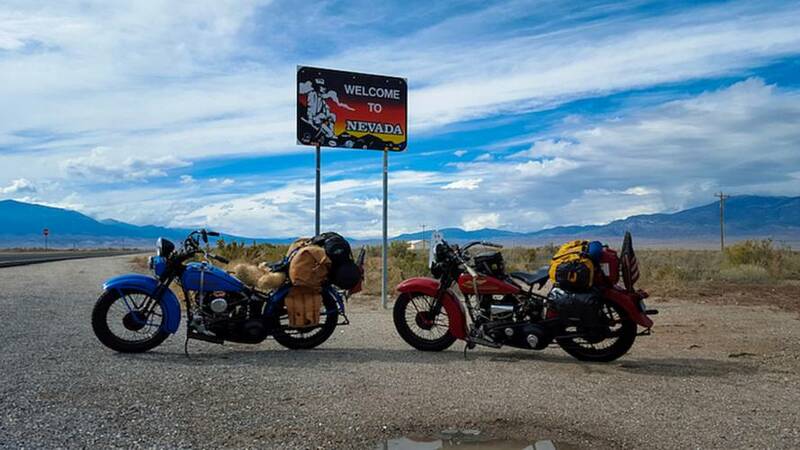 U.S. Route 50 through Nevada has just the right mix as you ride from one border of the state to the other. You'll be riding through 400+ miles of high desert with small towns spaced out every 100 or so miles and enough scenery to keep things interesting. Various small mountain ranges cut across the high desert, breaking up the plains. 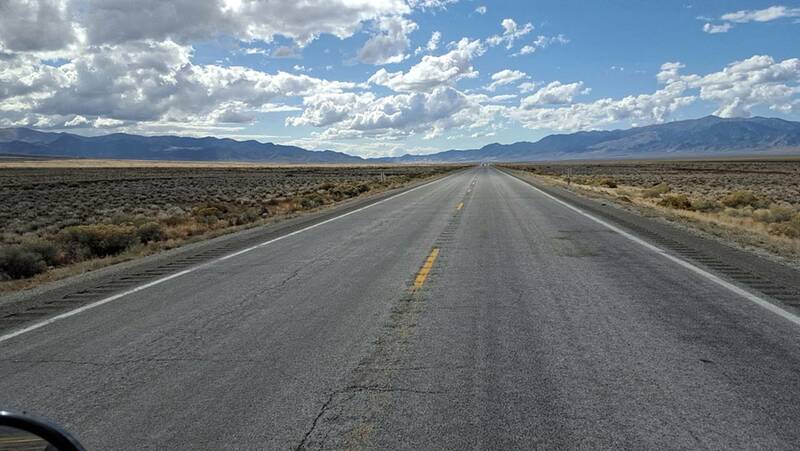 The basic path of Route 50 can be traced all the way back to the 1860s when it was used by the Pony Express and as part of the Central Overland Trail, connecting Salt Lake City, Utah, with Carson City, Nevada. Later it was part of the first transcontinental highway system, known as the Lincoln Highway which was formed in 1913. 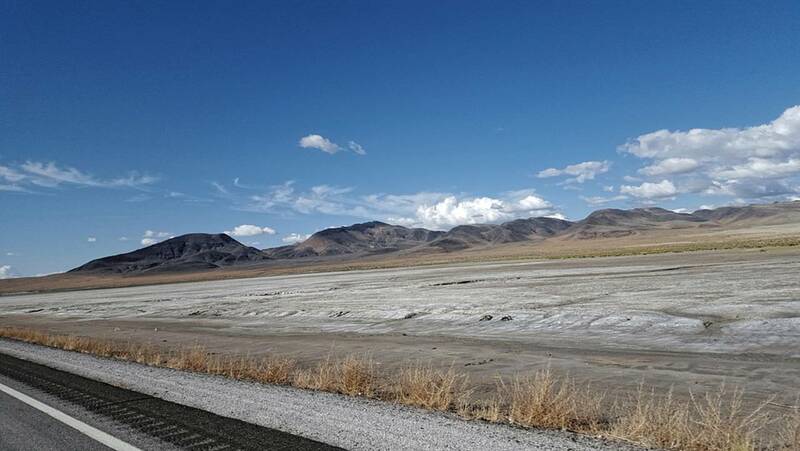 Essentially the route was made by attaching pre-existing highways, some of which have changed over the last 100 years, with the result being a road that crosses the center of Nevada from east to west. Some of the old Pony Express stations are still marked along the route. Gas, food, and gambling all in one place. 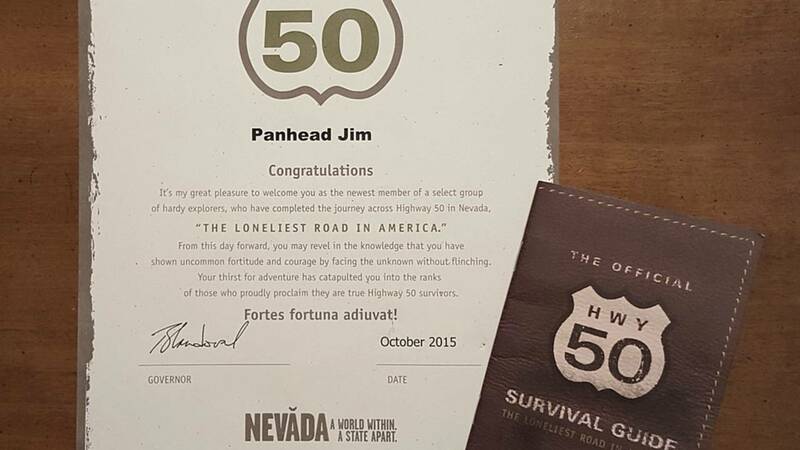 Since 1986 when Life magazine gave Route 50 the nickname "The Loneliest Road in America," Nevada has embraced the name and used it in various tourism ads. The Survival Guide is an example of this as it makes a challenge out of riding the entire route. 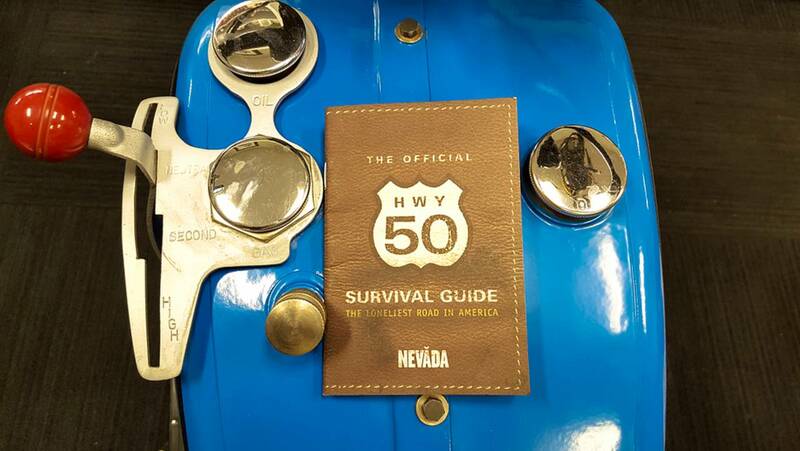 Besides being loaded with useful information about the road itself, it also gives you the opportunity to be recognized for completing Route 50. If you get your book stamped in five of the eight towns along the way, you can send off for a lapel pin and an official certificate signed by the governor. It's all free and easy to complete since every gas station along the way has the stamps - so you might as well accept the challenge. The perfect companion for your journey. It includes history, maps and fits in your jacket pocket. Leaving the Border Inn behind, the first thing you'll come to is a wide plain dominated by massive white windmills slowly turning in the breeze. After miles of wind farms, you'll roll into the first real town on Route 50, Ely. Originally just a way station on the Pony Express, Ely boomed in 1906 with the discovery of copper deposits in the surrounding mountains. Nowadays the big draw is the train depot and museum located downtown, which offers excursion trips on their restored steam engine. 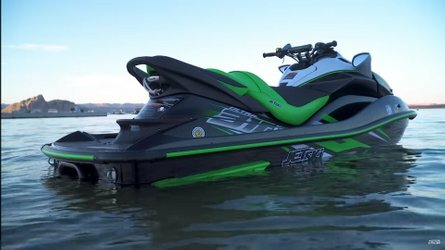 One important thing to note is the Ely is one of the coldest places in the continental United States, with nightly temperatures below freezing about two-thirds of the year. Make sure to dress accordingly if you plan on riding through after dark. Off in the distance you can see hundreds of white windmills slowly generating electricity. Leaving Ely, you'll start winding your way down the mountains. The town itself is at 6,500 feet above sea level, so it takes a while to get down into the high desert which is closer to 4,000 feet. But the views along the way are spectacular as long as you are not riding through the thick morning fog that often envelops the mountains. As you continue west, another mountain range will come into view and soon you'll be climbing your way back up to 6,500 feet as you pull into the town of Eureka. 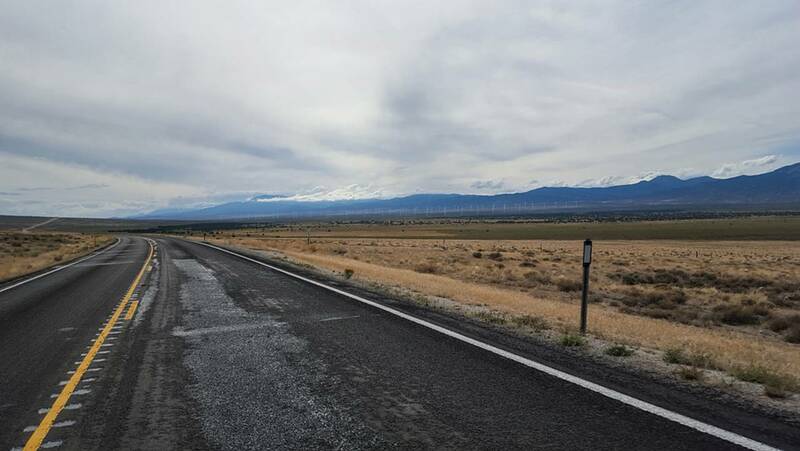 Total distance between Eureka and Ely is about 80 miles, so, as long as you're not on an electric motorcycle, you should be able to make it with ease. I also recommend stopping at the Pony Express Deli for one of their excellent tri-tip sandwiches. The perfect way to warm up after riding through the cool air in the mountains. Ely sits in the Egan Mountain Range, which accounts for its cold nightly temperatures. 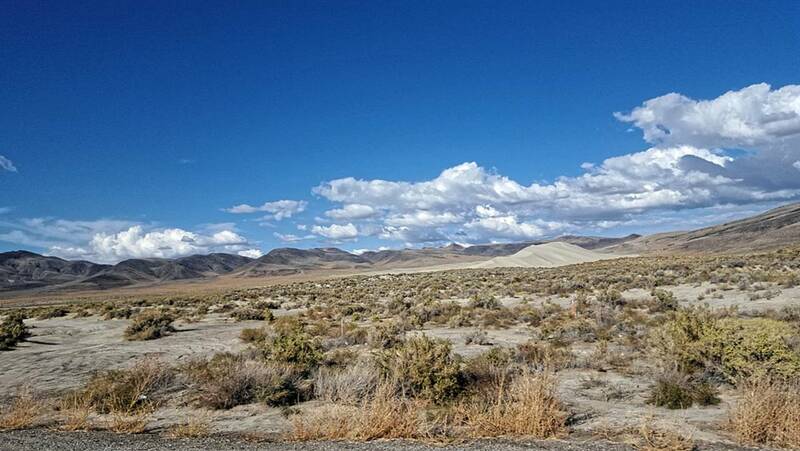 As with Ely, Eureka is on the western edge of the mountains, so once you leave town you're again winding your way back downhill to the high desert. This section of desert is home to the Hickison Petroglyph Recreation Area. It is located just off the highway and makes for a convenient stop to stretch your legs. A short hike will bring you to a cliff face lettered with petroglyph carvings dating back 10,000 years, which probably makes it some of the oldest graffiti in the United States. Modern day inhabitants also leave their mark by piling rocks along the sides of road to spell out words or shapes. After a little over an hour of riding you'll reach the town of Austin, which, just like all the other towns, is located on the western edge of a mountain range at an elevation of around 6,500 feet. It's only about 70 miles between Austin and Eureka, but if you didn't get gas in Eureka, you should definitely fill up now because the next gas station is more than 100 miles away. 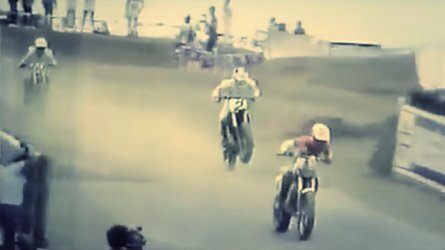 Now you are going to pass something a little bit unusual. No, it's not high desert plains and small mountain ranges (although there is plenty of that, too), but a giant sand dune. Most people have a pretty good idea of what a sand dune looks like from family trips to the beach as a kid: basically just a large hill of sand the size of a small house or so. Well, the Sand Mountain Recreation area is a little bigger than your average sand dune, coming in at 2 miles long and 600 feet high. As scene from the road, it is hard to believe that sand dune is two miles long. 110 miles from Austin is the city of Fallon. Aviation buffs have probably heard the name before as it is the home of the U.S. Navy's TOPGUN training facility (cue "Danger Zone" and prepare to request a fly by). For everyone else it's a small town with gas and a few places to eat. The main difference you'll notice about Fallon is that, for once, the town is not built in the mountains but rather on the high desert plain. With the towns spread so far apart, sometimes you just have to take a break on the side of the road. Now you are in the home stretch with just under 100 miles to go before you reach the border. Along the way, you're going to head through the capital of Nevada, Carson City. If you are into history, then you might want to plan on taking a little time to explore the town. Founded in 1858 and named for mountain man Kit Carson, Carson City has more than three dozen entries on the National Register of Historic Places. If you're looking for something a little more scenic, then I suggest rolling through Carson City and heading for Lake Tahoe. There are plenty of places to stay on the lake, from five-star hotels to campgrounds, so you can definitely find something that fits your budget. Whatever you choose, you're going to be ready for a good night sleep after covering more than 400 miles crossing the Silver State. 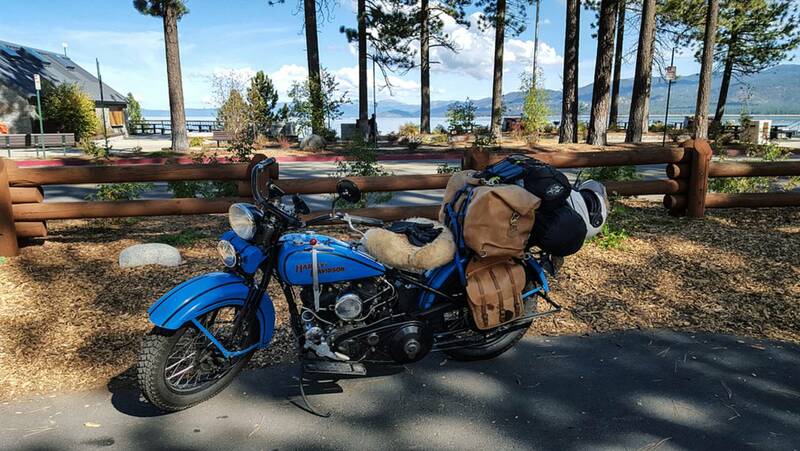 Just over the border in southern Lake Tahoe. 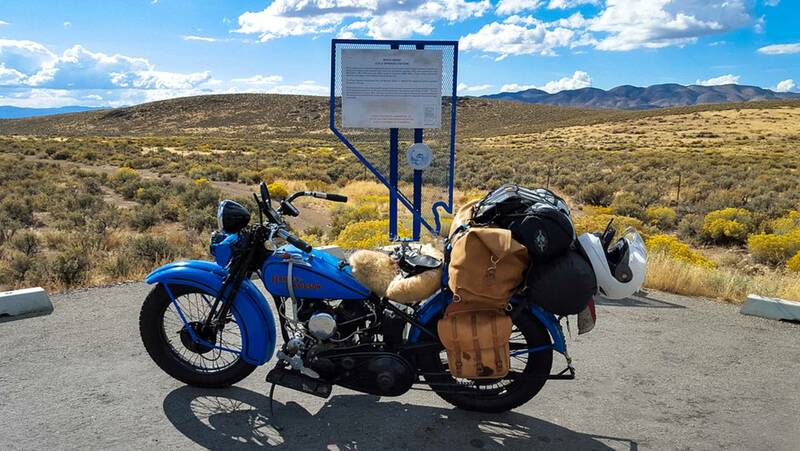 As far as motorcycling roads go, U.S. Route 50 through Nevada should be near the top of your list. 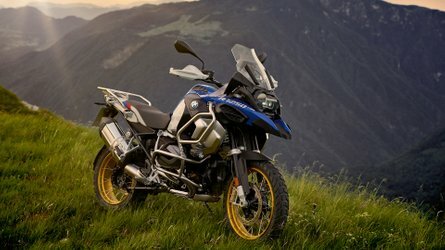 It's got a good mix of twisty mountain riding along with long wide open straightaways through some breathtaking country. 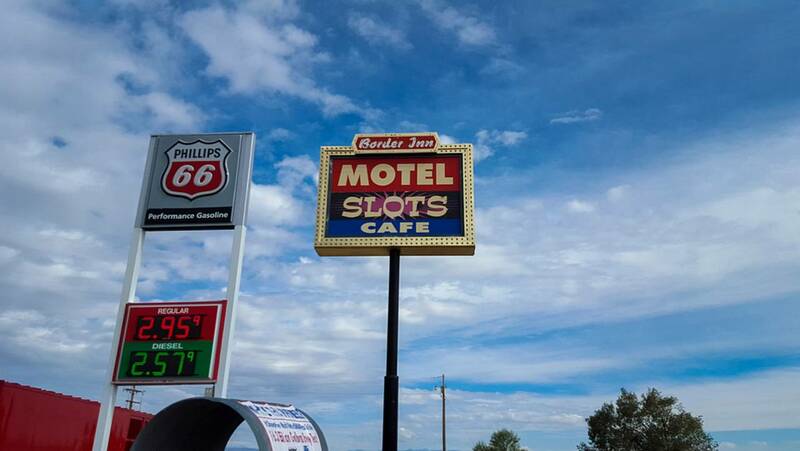 With a bit of history thrown in and just enough towns to keep your gas tank and stomach full, Route 50 is a great ride through the American West and not quite as lonely as its name. 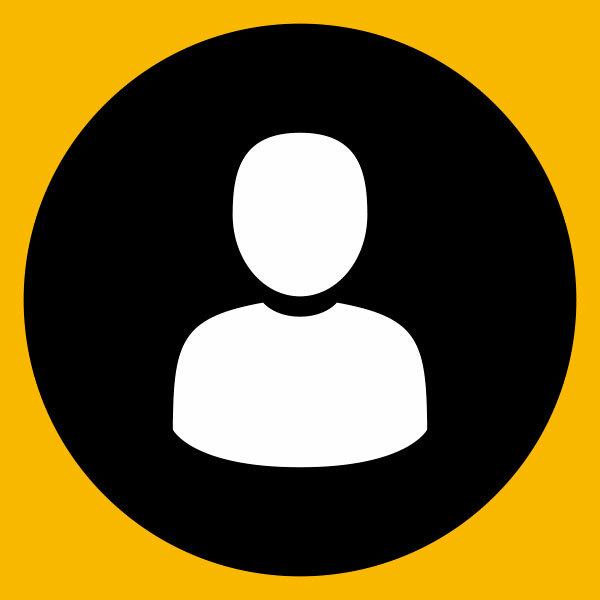 Don't forget to send in your documentation for your official certificate.